Don’t get me wrong, I’m big on pulses. The humble mung bean made up a significant part of my diet for two months, the stalwart chick pea is what’s got me through some troubled times and tinned, skinned and chilli-soaked fava beans on toast is a treat I try to reserve for when I’ve really weakened in the Lebanese supermarket. When you need to eat some protein, you can’t afford meat and you’re lactose intolerant the pulse is the place to go. And not just in those circumstances, of course- pulses are tasty and versatile and can do an excellent carb/protein combo for when you only have one pan. I ate them by the bucketload when I lived in a bedsit with a single hob and I still do now. They’re cheap, yet not so unwholesome that you’d feel unfair serving them to guests (provided you cook ’em nice like) and they’re no bother to store. Most pulses, though, require eight hours of soaking from their dried form. Eight hours! I know, theoretically, that I could put them in some water before I go to work, then boil ’em up when I get back in. I have done this. I know that, like walking to work, it is something that I could get a handle on quickly if I just made myself and it’d become as much part of my routine as brushing my teeth or having a cup of coffee. Enter the lentil. I spent half an hour in the (not exactly extensive) wholefoods section of my local Tesco Metro a few weeks ago reading the back of every pulse packet. Nothing, nothing was available to me without the overnight soak except lentils. Sure, aduki beans seem like a good idea (or at least, have an interesting name and I think I’ve eaten some at some point) but do I really want to be chained to a bowl of the fvckers until I finally give in and attend them with my slatted, foam-scrapey spoon? Real talk now: no of course I bloody don’t, no one in their right or wrong mind wants to do that, it is a process that at best is a means to a meal and at worst is a means to throwing the whole lot down the loo and getting a kebab. Lentils, though, a mere 20-30 minute boil (admitedly, with the foam scraping and subsequent washing but at least this event is shortened and lessened if you rinse them loads beforehand) and you’ve got ’em. Then fry a bit of onion, add spice and stock and you’ve got yourself a serviceable dinner. Slice a bit of tomato on top and squeeze lemon juice in if you feel like you deserve it; om nom nom. Eat it on toast for fusion cookery or stuff it into an oiled squash or marrow and bake for a delicious thing to impress your colleagues with when you reheat it for lunch the next day. Slosh them into soup and grate carrot and ginger all over them if you fancy showing Covent Garden kitchen how it’s done. Or add cooked apple or mango and raisins, a bit of honey and you’ve got some sort of fibrous dessert that you could probably serve with chilli ice cream and pass off as Blumenthal-level wizardry to the culinarily impaired. They’re great, they really are. I can’t really think of anything I couldn’t eat with lentils (admitedly this is probably because I’m thinking about lentils so haven’t considered the potential difficulties of, eg: steak) but still, there they are. Sitting in my cupboard in their lovely jars, in tupperware in my freezer because I’m incapable of portion control when cooking and lurking in the fridge at work, waiting for me to re-heat them for lunch. They should be reassuring, like bread but instead they fill me with guilt and a mild sense of horror- yes, they’re really versatile and I’ve got lots of them and yet I ate a Tesco Value Fishfinger sandwich for dinner last night rather than defrost my stored green lentil curry; what is wrong with me? Perhaps its because you can’t get gourmet lentils- they’re never going to be any nicer than they are. You can get different brands but the lentil is all, basically, the same; bread from Paul is substantially different from a Morrisons Value wholegrain loaf but there’s no artisanal lentil merchants that I’ve heard of. That doesn’t seem to ring true, though -I’m no food snob so maybe it’s just the massive quantities that lentils almost have to be bought in or perhaps I’m just really that lazy that if toast is there, I’ll eat that rather than do anything where I have to put the hob on, however much I like cooking. Either way, lentils, I’m sorry. You’ve been there for me before and no doubt will again but I’m afraid that you’ll always been my back-of-the-cupboard food, shoved aside as soon as a can of chickpeas comes to light or buy an aubergine. Steak and lentils sounds delicious! I once had a roast chicken breast with black lentils and it was TASTY. I used to have this problem, which I have recently solved via the joy of the mobile phone. All the foods that I buy when I worry I may not have enough on the way home I have put in one cupboard. I then take a photo of the contents of this cupboard once a month. THUS, when I am making a stew and wonder if I have enough split peas and pearl bailey. I can just check the photo rather than buy a new packet. Another way to use them is to increase the amount of stuff you braise. A braised chicken leg takes about 35 minutes, as do lentils to tender. So braise and throw a handful in every time. The trick is to master the culinary time-shift — to start thinking about tomorrow’s supper shortly after finishing tonight’s. That way, you can chuck the beans in to soak before you go to bed, so you don’t have to deal with it in the morning. And are slow cookers a known thing on that side of the Atlantic? They’re a pretty big deal here in the States, and I think it’s the best investment a chronic bean-eater can make. Again, it takes a bit of prep work the night before — chop some veg, toss ’em in a plastic bag and stick it in the fridge overnight while the beans soak — but it’s so satisfying to throw everything in the crock in the morning, push a couple of buttons, and know that you’ll have a hot meal waiting for for you when you come home from work. Close your eyes for a moment and you can pretend that you have a personal chef. @Kerry- Yes, pretty much as soon as I wrote ‘steak’ I was like ‘actually that would be great’ but I was at a loss of anything else to fill the word space so there it is. Perhaps egg would not go with lentils? Or possibly nothing doesn’t suit them. @Pete- my problem is I KNOW there’s loads of them. There’s ALWAYS loads of them. I could run a Hare Krishna stand for a week off my cupboard. 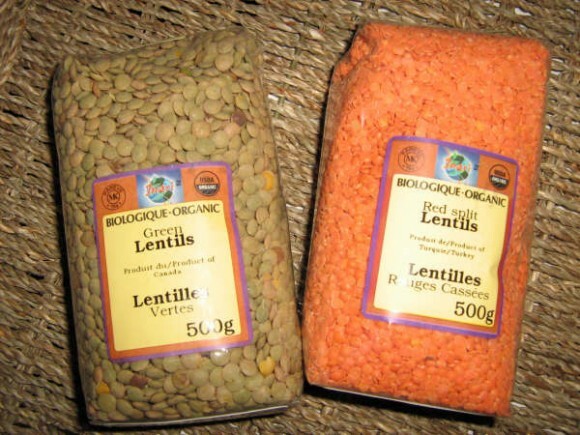 It’s the buying in all the different colours that does it… Re: Puy, this is a good point but I meant that you couldn’t get a fancier form of red lentils. Must get self some Puy lentils, actually, just to add to the value of the Mog Lentil Surplus. @Jack Fear- if I could teach myself this skill my life would have run far more smoothly! Unfortunately I think about my lunch/breakfast more and rarely eat proper dinner, no doubt to my detriment. Slow cookers are steadily coming in (in fact my favourite enquiry when I worked for Waterstones was someone asking if we had a chart of bestselling slow-cooker cookbooks) but they’re not a standard kitchen object. In fact it took me a long time to realise that they’re not pressure-cookers. I think this is the real truth. Om nom nom lentil ice cream. Re: Soaking. I find the cheats method of pouring boiling water over them, soaking for an hour, draining and then rinsing works just as well as an 8 hour soak. For even quicker pulse cooking get a pressure cooker, and reduce your cooking time to about a quarter. Pearl barley. So tasty. No need to soak for 8 hours, just rinse them and stick them in a casserole for 90 mins. (This is my lasting tribute to my Grandfather who made this “joke” every time we had a stew). That said, the cereal side of this conversation should not be ruled out. @3, yes, Puy lentils are royalty among pulses. I wouldnae touch a lot of the other bean things you mention – but am quite a fan of lentils. My absolute favourite are Alubias del Tolsa which are an incredible pulse which unfortunately only appears to grow well in a small part of the Basque region. We tried to grow some once when we were living in Brighton, but I think only one of the beans produced anything at all. They are usually boiled into a stew and served with local blood sausage and sliced, barbequed pork belly. One of the best things I’ve ever eaten, from an area renowned for the quality of food.